They say it's "where the truth lies"
A famous ad guy named Jerry Della Famina once said that advertising is "the most fun you can have with your clothes on." But Jerry's career made him very rich and well known. Of course it was fun. Watch AMC's Mad Men and you see a very intriguing, if much "less fun" presentation of the advertising business. 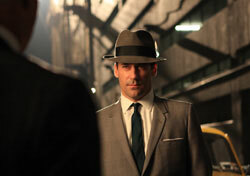 Mysterious and tempermental, Donald Draper is creative director of the fictional 1960s ad agency Sterling Cooper. The series begins in late '59 or early '60. Now through its second season, Mad Men has worked its way into 1962. This was an era when alcohol flowed freely, cigarettes burned incessantly and sexism oozed naturally. But it was also an era when standards of dress and professional decorum were significantly higher--even for creative people. As the key character, Draper is portrayed as a man who spends a lot of time with his clothes actually off and in the arms of various women--even his wife from time to time. Don's life is one of secrets, lies and false identities. In fact, he's not even really who he says he is, having stollen the "Don Draper" identity right off the dog tags of a fellow soldier who'd been blown to bits in the Korean War. Mad Men's cast is full of characters who combine the best and worst of human nature. There's a one night stand that leads to hard feelings down the road and a baby put up for adoption. Wives in the series are tormented by the imprisonment of suburbia and the nagging suspicion that their husbands are cheating. At the same time, young secretaries at the firm dream of the day when they can escape the drudgery of the typing pool for the confines of New York's bedroom communities. Agency partner Roger Sterling serves as wonderfully predictable foil and friend to Draper. He frequently is presented as a feckless cad yet at the same time he is someone that comes off as a somewhat sympathetic character seemingly haunted by uncontrollable libido or the prospect of yet another heart attack. And though the partner named Cooper rarely appears in the show, he amuses viewers as a "stereotypical eccentric," obsessed with art, image and old-time New York connections. The show has everything those who've worked in advertising will find familiar. There are self-absorbed creatives, scheming account executives and virtually everyone is on the make. Hard work proves one route to the top, but no more effective than good political skills or proficiency between the sheets. The program is very true to its era. We see evidence of those places and events that defined the era--Kennedy vs. Nixon, Castro, early medical warnings about the dangers of smoking. And the costuming and set construction is wonderfully authentic to my eyes. I see characters reach into the cupboard and pull out smokey drink tumblers with copper leaves and bands--just like my own Mom served to her thirsty, heavy-smoking bridge club in the early 60s. Mad Men is true to the lifestyle of ad men as well. In the early 80s, I worked in Cleveland for an agency called Meldrum & Fewsmith. From the layout of offices with exec offices surrounding typing pools to an eccentric CEO, I find many similarities between that agency and the fictional firm set 20 years earlier. We had old-style phones with rotary dials and buttons showing the line that was lit for you. There was a switchboard with pull-out jacks. There were nightly stops at downtown bars and lounges and ongoing solicitousness between the sexes. It doesn't escape me that many of the older folks at Meldrum were graduates of the New York ad scene and would have been working in the Big Apple during the Mad Men era. I have no doubt that the series will compel people of all ages to take a new interest in the advertising profession. See it on AMC (American Movie Classics) or purchase previous episodes from iTunes. DVD sets are also available. Mad Men definitely does not portray advertising as being the rollicking good time Jerry Della Famina once cheered. Still, there is a part of me that wants a cigarette every time I watch it.